Medium to one dark well-defined shale phantoms, some capped and/or sided in white are clearly defined in the fine crystals of this Arkansas lace-like rare blue phantom plate cluster. If you are a jeweler, this cluster will make an outstanding focal for your next piece. If you are a collector, this nearly pristine, rare small cabinet piece will rate center stage. 1-3/4x 2-1/2x >1/2" tall. 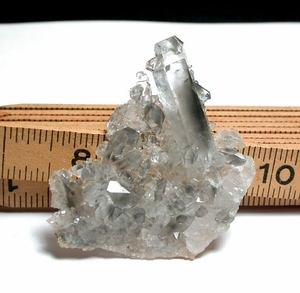 The largest crystal is penetrated at its' nose by a heart shaped, twinned doubly-terminated crystal as well as a multi-terminated nicely phantomed crystal and is 9/16x 1-1/2". Entirely self-supporting except for a 3/16x 1/2" of glittering sandstone at a back bottom edge. And yes, you are looking directly through the cluster where the crystals are not grown together.